St. Perpetua was a 22-year old married noble and a nursing mother. 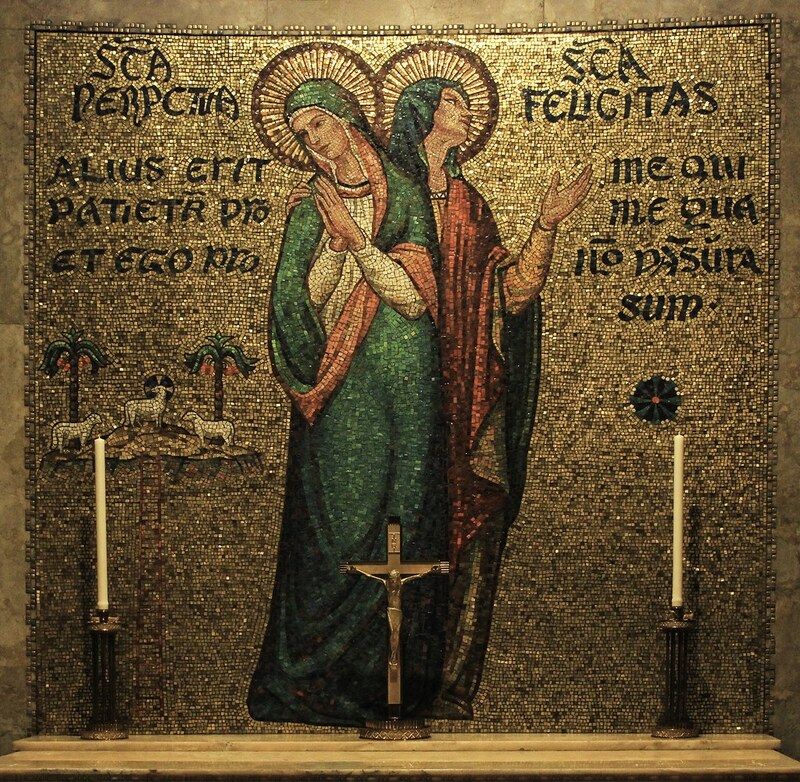 Her co-martyr St. Felicity, an expectant mother, was her slave. They suffered together at Carthage in the Roman province of Africa. The Passion of Sts. Perpetua, Felicitas, and their Companions in 203 is said to preserve the actual words of the martyrs and their friends. It took place during the persecutions of the emperor Septimius Severus. Below you have the 2nd reading of the Divine Office of today’s memorial which recount their martyrdom. The day of the martyrs’ victory dawned. They marched from their cells into the amphitheatre, as if into heaven, with cheerful looks and graceful bearing. If they trembled it was for joy and not for fear. Saturus, too, in another gate, encouraged the soldier Pudens, saying: “Here I am, and just as I thought and foretold I have not yet felt any wild beast. Now believe with your whole heart: I will go there and be killed by the leopard in one bite.” And right at the end of the games, when he was thrown to the leopard he was in fact covered with so much blood from one bite that the people cried out to him: “Washed and saved, washed and saved!” And so, giving evidence of a second baptism, he was clearly saved who had been washed in this manner. Then Saturus said to the soldier Pudens: “Farewell, and remember your faith as well as me; do not let these things frighten you; let them rather strengthen you.” At the same time he asked for the little ring from Pudens’s finger. After soaking it in his wound he returned it to Pudens as a keepsake, leaving him a pledge and a remembrance of his blood. Half dead, he was thrown along with the others into the usual place of slaughter. The people, however, had demanded that the martyrs be led to the middle of the amphitheatre. They wanted to see the sword thrust into the bodies of the victims, so that their eyes might share in the slaughter. Without being asked they went where the people wanted them to go; but first they kissed one another, to complete their witness with the customary kiss of peace. The others stood motionless and received the deathblow in silence, especially Saturus, who had gone up first and was first to die; he was helping Perpetua. But Perpetua, that she might experience the pain more deeply, rejoiced over her broken body and guided the shaking hand of the inexperienced gladiator to her throat. Such a woman – one before whom the unclean spirit trembled – could not perhaps have been killed, had she herself not willed it. ℟. Christ Jesus is at God’s right hand and pleads our cause. * Then what can separate us from the love of Christ? Can affliction or hardship? Can persecution, hunger, nakedness, peril or the sword? ℣. These are the trials through which we triumph, by the power of him who loved us. * Then what can separate us from the love of Christ? Can affliction or hardship? Can persecution, hunger, nakedness, peril or the sword? With overwhelming love for you, Lord God, your martyrs Perpetua and Felicity defied the persecutor and overcame the pain of death. Listen to their prayers and grant that we may love you daily more and more. Through our Lord Jesus Christ, your Son, who lives and reigns with you and the Holy Spirit, one God, for ever and ever.